In 1850, Dr. Washington Wentworth Sheffield, a dental surgeon and chemist, invented the first toothpaste. He was 23 years old and lived in New London, Connecticut. Dr. Sheffield had been using his invention, which he called Creme Dentifrice, in his private practice. The positive response of his patients encouraged him to market the paste. He constructed a laboratory to improve his invention and a small factory to manufacture it. Modern toothpaste was invented to aid in the removal foreign particles and food substances, as well as clean the teeth. When originally marketed to consumers, toothpaste was packaged in jars. Chalk was commonly used as the abrasive in the early part of the twentieth century. Sheffield Labs claims it was the first company to put toothpaste in tubes. Washington Wentworth Sheffield's son, Lucius, studied in Paris, France, in the late nineteenth century. Lucius noticed the collapsible metal tubes being used for paints. He thought putting the jar-packaged dentifrice in these tubes would be a good idea. Needless to say, it was adopted for toothpaste, as well as other pharmaceutical uses. The Colgate-Palmolive Company also asserts that it sold the first toothpaste in a collapsible tube in 1896. The product was called Colgate Ribbon Dental Creme. In 1934, in the United States, toothpaste standards were developed by the American Dental Association's Council on Dental Therapeutics. They rated products on the following scale: Accepted, Unaccepted, or Provisionally Accepted. The next big milestone in toothpaste development happened in the mid-twentieth century (1940-60, depending on source). After studies proving fluoride aided in protection from tooth decay, many toothpastes were reformulated to include sodium fluoride. Fluoride's effectiveness was not universally accepted. Some consumers wanted fluoride-free toothpaste, as well as artificial sweetener-free toothpaste. The most commonly used artificial sweetener is saccharin. The amount of saccharin used in toothpaste is minuscule. Companies like Tom's of Maine responded to this demand by manufacturing both fluoridated and non-fluoridated toothpastes, and toothpastes without artificial sweetening. Many of the innovations in toothpaste after the fluoride breakthrough involved the addition of ingredients with "special" abilities to toothpastes and toothpaste packaging. In the 1980s, tartar control became the buzz word in the dentifrice industry. Tarter control toothpastes claimed they could control tartar build-up around teeth. In the 1990s, toothpaste for sensitive teeth was introduced. Bicarbonate of soda and other ingredients were also added in the 1990s with claims of aiding in tartar removal and promoting healthy gums. Some of these benefits have been largely debated and have not been officially corroborated. 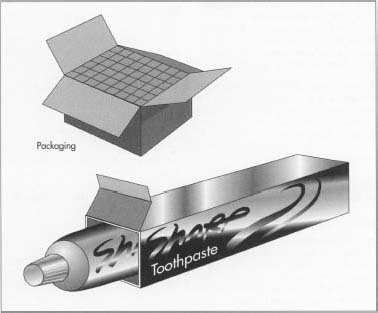 Packaging toothpaste in pumps and stand-up tubes was introduced during the 1980s and marketed as a neater alternative to the collapsible tube. 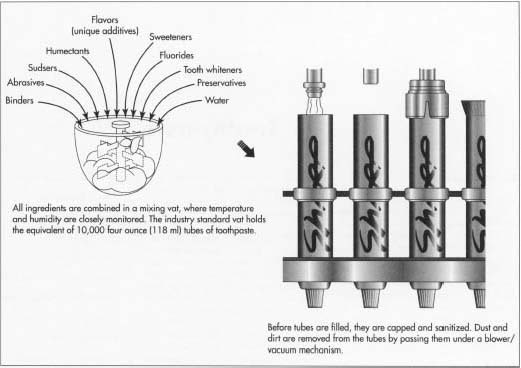 In 1984, the Colgate pump was introduced nationally, and in the 1990s, stand-up tubes spread throughout the industry, though the collapsible tubes are still available. Every toothpaste contains the following ingredients: binders, abrasives, sudsers, humectants, flavors (unique additives), sweeteners, fluorides, tooth whiteners, a preservative, and water. Binders thicken toothpastes. They prevent separation of the solid and liquid components, especially during storage. They also affect the speed and volume of foam production, the rate of flavor release and product dispersal, the appearance of the toothpaste ribbon on the toothbrush, and the rinsibility from the toothbrush. Some binders are karaya gum, bentonite, sodium alginate, methylcellulose, carrageenan, and magnesium aluminum silicate. harsh than others, sometimes resulting in unnecessary damage to the tooth enamel. The most commonly used abrasives are hydrated silica (softened silica), calcium carbonate (also known as chalk), and sodium bicarbonate (baking soda). Other abrasives include dibasic calcium phosphate, calcium sulfate, tricalcium phosphate, and sodium metaphosphate hydrated alumina. Each abrasive also has slightly different cleaning properties, and a combination of them might be used in the final product. Sudsers, also known as foaming agents, are surfactants. They lower the surface tension of water so that bubbles are formed. Multiple bubbles together make foam. Sudsers help in removing particles from teeth. Sudsers are usually a combination of an organic alcohol or a fatty acid with an alkali metal. Common sudsers are sodium lauryl sulfate, sodium lauryl sulfoacetate, dioctyl sodium sulfosuccinate, sulfolaurate, sodium lauryl sarcosinate, sodium stearyl fumarate, and sodium stearyl lactate. Humectants retain water to maintain the paste in toothpaste. Humectants keep the solid and liquid phases of toothpaste together. They also can add a coolness and/or sweetness to the toothpaste; this makes toothpaste feel pleasant in the mouth when used. Most toothpastes use sorbitol or glycerin as humectants. Propylene glycol can also be used as a humecant. Toothpastes have flavors to make them more palatable. Mint is the most common flavor used because it imparts a feeling of freshness. This feeling of freshness is the result of long term conditioning by the toothpaste industry. The American public associates mint with freshness. There may be a basis for this in fact; mint flavors contain oils that volatize in the mouth's warm environment. This volatizing action imparts a cooling sensation in the mouth. The most common toothpaste flavors are spearmint, peppermint, wintergreen, and cinnamon. Some of the more exotic toothpaste flavors include bourbon, rye, anise, clove, caraway, coriander, eucalyptus, nutmeg, and thyme. In addition to flavors, toothpastes contain sweeteners to make it pleasant to the palate because of humecants. The most commonly used humectants (sorbitol and glycerin) have a sweetness level about 60% of table sugar. They require an artificial flavor to make the toothpaste palatable. Saccharin is the most common sweetener used, though some toothpastes contain ammoniated diglyzzherizins and/or aspartame. Fluorides reduce decay by increasing the strength of teeth. Sodium fluoride is the most commonly used fluoride. Sodium perborate is used as a tooth whitening ingredient. Most toothpastes contain the preservative p-hydrozybenzoate. Water is also used for dilution purposes. 1 After transporting the raw materials into the factory, the ingredients are both manually and mechanically weighed. This ensures accuracy in the ingredients' proportions. Then the ingredients are mixed together. Usually, the glycerin-water mixture is done first. 2 All the ingredients are mixed together in the mixing vat. The temperature and humidity of vat are watched closely. This is important to ensuring that the mix comes together correctly. A commonly used vat in the toothpaste industry mixes a batch that is the equivalent of 10,000 four-ounce (118 ml) tubes. 3 Before tubes are filled with toothpaste, the tube itself passes under a blower and a vacuum to ensure cleanliness. Dust and particles are blown out in this step. The tube is capped, and the opposite end is opened so the filling machine can load the paste. 4 After the ingredients are mixed together, the tubes are filled by the filling machine. To make sure the tube is aligned correctly, an optical device rotates the tube. Then the tube is filled by a descending pump. After it is filled, the end is sealed (or crimped) closed. The tube also gets a code stamped on it indicating where and when it was manufactured. 5 After tubes are filled, they are inserted into open paperboard boxes. Some companies do this by hand. 6 The boxes are cased and shipped to warehouses and stores. Each batch of ingredients is tested for quality as it is brought into the factory. The testing lab also checks samples of final product. Garfield, Sydney. Teeth Teeth Teeth. Simon and Schuster, 1969. Colgate-Palmolive. 1996. http://www.colgate.com/ (July 9, 1997). Crest web site. 1996. http://www.pg.com/docYourhome/docCrest/directory_map.htm 1 (July 9, 1997). I have always wondered how toothpaste is made. This information provides that answer for me. The historical piece is very interesting. Ancients used lead? What were they thinking? I really need this information. Is it fine for you if I ask something more about this made.